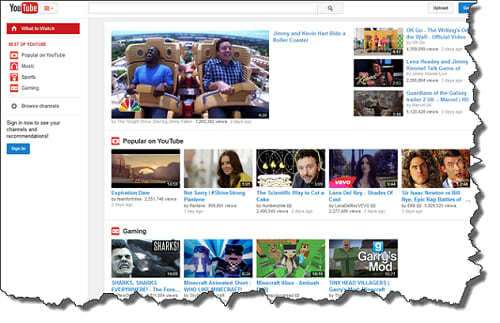 Q: "oh, i think youtube should broaden them standard to accept more video format, especially hd videos like avchd. since right now when i want to share my avchd recordings, i always need a avchd converter to convert avchd to youtube supported videos, than they'll allow me upload avchd to youtube." If you are a HD camcorder user, you must be quite familiar with AVCHD video file (.mts/.m2ts extension), because AVCHD video is the dominant HD format for camcorder recording and playback. Apart from playing back AVCHD video on computer, watching AVCHD recordings on Blu-ray disc player/PS4, enjoying AVCHD on portable multi-media devices, moreover, uploading AVCHD video to YouTube so that everyone can appreciate your brilliant recording on YouTube is also fantastic. You may need the secrect to compress videos for YouTube while keeping good quality. How to Convert and Upload AVCHD Video to YouTube? 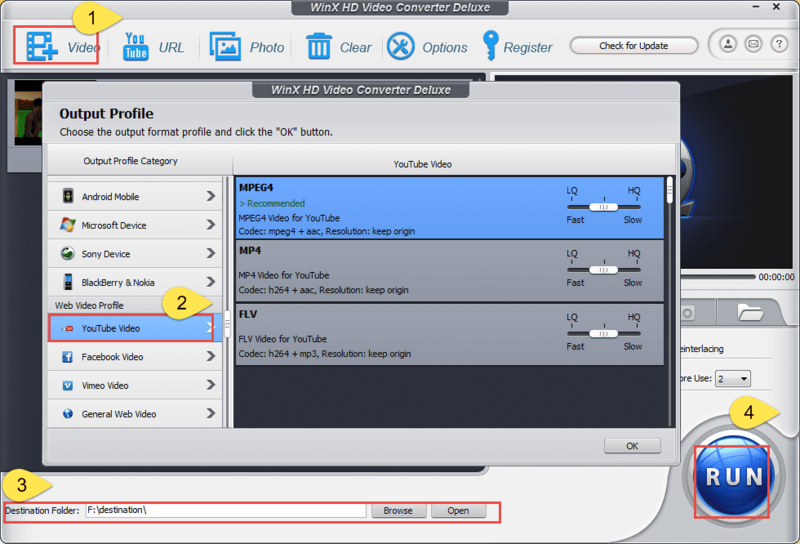 WinX HD Video Converter Deluxe - Convert AVCHD video to YouTube playable formats like MP4, FLV and WebM. Though YouTube supports a very wide variety of video codecs, audio codecs and container formats, you still can not upload your AVCHD file to YouTube. How to take this format matter away? The knack is just a decent AVCHD to YouTube converter by which you can convert your AVCHD file to YouTube compatible format first and then upload the converted video directly to YouTube website. 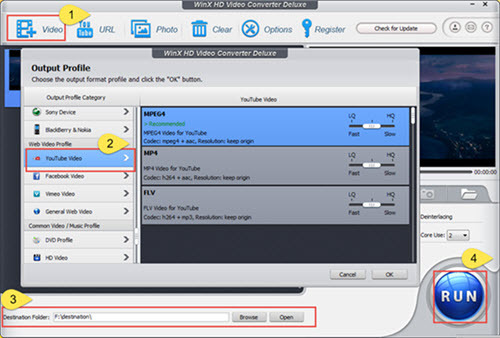 Among the diverse AVCHD to YouTube converters on the market, WinX HD Video Converter Deluxe is undoubtedly one of the best AVCHD to YouTube converting program, which not only fully supports turning AVCHD to MP4, AVI, MOV, FLV, WebM, MPEG, 3GP and other formats video, playable on YouTube, but also outputs YouTube available video with favorable high definition quality in the shortest time. MP4, WebM files (VP8 video codec and Vorbis audio codec), MPEG4, 3GPP and MOV files - (typically supporting h264 and MPEG4 video codecs and AAC audio codec), WMV, FLV (Adobe - FLV1 video codec, MP3 audio), AVI (many cameras output this format - typically the video codec is MJPEG and audio is PCM), MPEG-PS (typically supporting MPEG2 video codec and MP2 audio). WinX HD Video Converter Deluxe can convert AVCHD MTS/M2TS video to all the video formats above for uploading to YouTube except MPEG-PS. 2. The lengths of audio and video should be the same. To ensure viewers can experience a delightful HD video enjoyment, YouTube requres that your uploaded AVCHD video must match with its audio. And WinX HD Video Converter Deluxe, equipped with Force A/V Sync function in "Safe Mode", can guarantee you the smoothest AVCHD video playback process and the audio recordings could perfectly match up with video shootings. 3. YouTube prefers de-interlaced files (quite important). Since the video recorded by AVCHD camcorders, except for AVCHD Lite (720p) models, is 1080p interlaced one, the converting software you use must have De-interlacing Engine internally so that you can pretend your AVCHD video on YouTube as clear as the original one, or the you will encounter a vague look as the "Before De-interlaced" one in the figure. WinX HD Video Converter Deluxe happens to be this one. Embedded with advanced De-interlacing Engine, it can fully support converting AVCHD video from interlacing to progressive scanning, bringing you about more vivid and smooth image. To start AVCHD to YouTube video converting, you need to free download WinX HD Video Converter Deluxe, install it on your PC and launch it for preparation. Step 4: Hit "RUN" to start the AVCHD to YouTube conversion. After succesfully converting your AVCHD MTS/M2TS video to YouTube available video formats, you can freely upload it to the YouTube website, sharing your delightful moments with your friends and epals. 1. This unique AVCHD to YouTube converter supports multi-track video, which helps you upload YouTube video with the language track you preferred. 2. Due to supporting multi-core CPU (up to 8) and being armed with Hyper Threading Technology and optimized AMD 3DNow! and Intel SSE3 SSE2 MMX Instructions, WinX AVCHD to YouTube converter program delivers a 32x faster converting speed. 3. With more than 370 built-in video/audio codecs, it enables you to manipulate your SD, HD and UHD videos' format issue at one go, easily converting AVCHD to MP4, converting AVCHD to AVI, converting AVCHD to MOV etc. 4. Apart from turning AVCHD to YouTube, it can also convert AVCHD to iPhone, play AVCHD on iPad/iPad mini, iPod, Apple TV, Android, PSP and other portable devices, as well as your AVCHD Player or AVCHD editor software. >> Still have question on how to Convert and Upload AVCHD to YouTube, please feel free to Email Us. If you need to download YouTube videos, convert video to the best video size for YouTube uploading, make movable photo slideshow, WinX HD Video Converter Deluxe is also worth a try. How to Play HD Videos MKV M2TS on Google New Nexus 7 Widescreen? How to Compress HD Video MKV to Samsung Galaxy Round? How to Convert and Play MKV M2TS to The New HTC One?